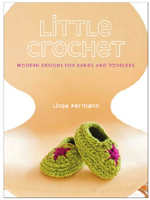 Today I am proud to share with you Linda Permann's brand-new book, Little Crochet! I first met Linda via email when she was preparing to write a review of Freddie's Blanket this fall. We met in person at TNNA in January, and had a great time visiting together there. Most recently, Linda came to Denver to film her new crochet classes with Sympoz, and we were able to meet up for dinner, which was especially fun since I had a review copy of her book with me! Crochet is something I have always admired but never taken the time to learn very well. I made a pair of Raggedy Ann and Andy dolls a few years ago, but aside from edging my handknits, that's about the extent of my knowledge of the craft. My grandmother was a gifted crocheter, and made me a blanket 25 years ago. I kept it on my bed for years and years, and it has now found a home with our toddler. And we found her clear instructions easy to follow- off we went, making the circle! and the Sweet Dreams Sleep Sack are a few of my favorites! 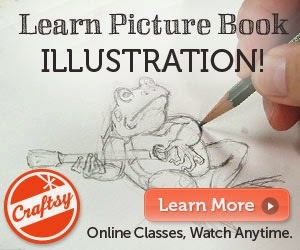 There are 24 patterns included in the book, along with great instructions for techniques, gorgeous photography, and an index- this part is really helpful for me, as a beginner. You can see all of Linda's great patterns here on her Ravelry page. On to the giveaway... 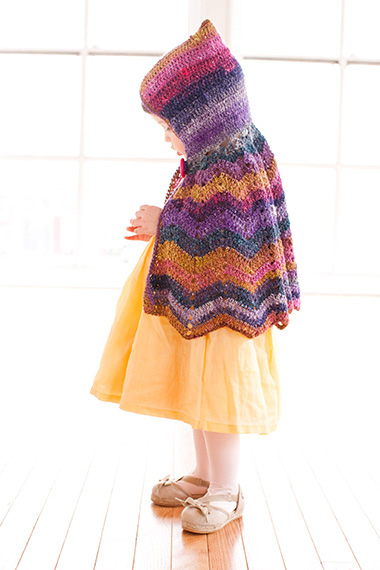 I am happy to say we are giving away a copy of Little Crochet to one of our blog readers. I am also including some yarn, too! 4 skeins of Brown Sheep Cotton Fine and some tidbits from my stash for the embroidery... to make the Sweet Daisy Sundress. And 2 skeins of Brown Sheep Cotton Fleece, to make a little boy bib. We can't forget the boys, can we? Has anyone ever crocheted anything for you? If so, what? If not, that's okay, comment anyway! Share the giveaway on fb or twitter, and leave a second comment to enter twice! Comments are now closed, congrats to Sarah our winner! My mom used to free-form hats for me when I was little. She never really learned patterns. The were so ugly and had somewhat of a mushroom effect but I love her for it and can laugh with her about it now. My great aunt made all the new babies in our family these clowns with rattles in them and a matching blanket. Each child got a different colored striping yarn so we know which ones are ours. They are definitely something I will always treasure and I hope that when I have a baby someone will spoil my child like she did us. I haven't been given any crocheted gifts but I have given several. I've made baby blankets, stuffed animals, cowls, and wash cloths. They are always well received. The blanket I made for my niece is her favorite, that just warms my heart! I haven't had anyone crochet anything for me, I'm the only person in my family who does it. But, my aunt's mom has knitted baby blankets for my children. I love to give crocheted gifts now though and I've got a few babies to gift to this year! I am blessed to say that both of my grandmothers crocheted. When I was a little girl, my Granny, my Dad's mom, made me a doll in a crocheted dress with the fullest skirt I had ever seen and bright red to match my room at the time. You were supposed to twirl the doll around and then set her the middle of the bed. I passed it down to my daughters, along with the crochet skills and hooks that were passed down to me. When I graduated from high school, my Grandma on my mom's side made each of her grandchildren an afghan with a matching pillow. Before she passed away, she wanted to make a blanket for each of the great grandchildren. I have the ones she made for my oldest three (although they are the size of shawls, really) and treasure them. They were the last ones she made before her Parkinson's took her hands out of her control. We saw Linda's book at the DFW Fiber Fest yesterday and my daughters feasted in the beautiful images inside and imagined themselves making everything! Thank you for the giveaway chance! My mother in law crocheted some items for me and my daughter and I are learning! thanks for the review and giveaway. I have never received a crochet gift but I love to give them! I can't wait to get my hands on this book, that little cape is calling my daughter's name. I also shared on FB :) on the Tots and Bottom's page. I usually crochet things for the others... lovely giveaway! My grandmother made me a beautiful afghan when I was about 8. I still have it! What a neat book! My grandmother crocheted giraffe afghans for my brother and I when we were little. His was normal colors, but mine was pink and red and purple. We kept them until they were damaged beyond repair in a flood in our teens. Actually, I've never gotten anything from anyone. I like to give the crocheted gifts. That's okay, I like being the giver. I'm not sure anyone's ever crocheted anything for me - I'm the crocheter around here, so it's usually me giving things away. In fact, I'm really excited about the rocket applique pattern in the book, because it's just what I need to complete a baby shower gift I'm working on right now! Only once, a friend made an afghan for me as a wedding present. Otherwise, I crochet a lot of stuff for other people. Yes, my grandmother crochet me the Kitschy kitchen clothes with the doll faces in the center as a wedding gift back in 1981. I remember thinking how much I disliked them. Now they are priceless. I appreciate that she spent that time thinking of me as she was making them. Cannot remember ever receiving a proceed gift but I like making scarves for everyone. I learned to crouched from my grant and remember extremely ugly and so not square potholes I made for her after she taught me. I alwaysincreased by one each row as I proceed in the turning chain an to even it out I skipped stitches. My grant used them until the were so used they didn't protect her hands anymore. I still have it & I love it, but I only really started to appreciate how much work & yarn it took once I started knitting. I'm teaching myself to crochet now & this book looks great! I don't recall anyone crocheting anything for me although I have enjoyed a few knitted gifts over the years. I have made others crocheted items though and can't wait to get my hands on this book. one year for Christmas - very lean times for our family - my Mom crocheted outfits for every one of my dolls and my sister's dolls. It was such a surprise that I remember it with love still some 55 years later. Crochet is my passion so I have crocheted many gifts but have not received a crochet gift!! 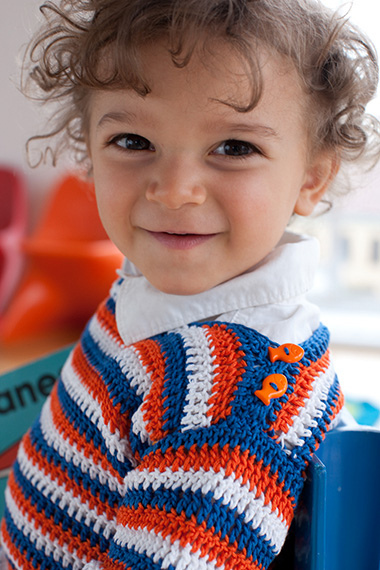 I would love this book so I can crochet lots of items for my little grandsons. My mom used to "grandma-sit" an elderly neighbor. When the kids (in their 50s) needed to go somewhere at night, my mom would sit with the older woman & keep her company. During this time, "Grandma F" was always crocheting. My mom didn't know it but what she was crocheting was a gift for my mom - a ripple pattern afghan. Grandma F and my mom have since passed away and I now have that treasured afghan. When I moved into my first apartment, my sister crocheted an afghan for me. I still have it - 35 years later! My Mom crochets the most beautiful heirloom blankets. She made one for each of my children when they were born and they are treasured and well-used items. I'd love a chance to win a copy of this darling book together with your yarn. Who wouldn't want to get started right away creating these adorable items! Yes! My aunt made a bedspread for each of her 16 nieces and nephews as a wedding present - all different patterns and colours! Mine is now on the guest bed and still in great shape. Like you, I know enough to do edgings etc but this would inspire me onwards!! I don't think anyone has ever crocheted something for me. My little brother started to make a crocheted top for my dolls, but never finished it. Though I have crocheted lots of things for myself and others. Thank you for the chance to win such a cute book! My mother made me a beautiful crocheted blanket when I was 17y/o.It was made from woool with purple & cream blocks that mom sewed together.When It was done, one could not see a single seem.I still have this blanket over 30 years later & it is in great shape. This is so lovely giveaway,and so generous of you to include yarn too.I always crochet something for myself,don't have anybody to do that for me,but I receive once crochet scarf in swap. I have a granny square blanket crocheted by my great-grandmother. It has a place of pride in my guest room for all the family to use when they come to visit me! She did teach me to crochet when I was younger, and my favorite memory is of my cousin, T.J. quickly making squares while I was still working on a basic chain! 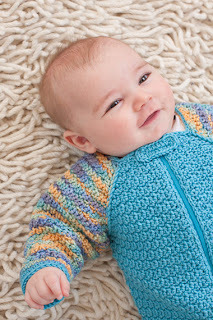 With a little boy of my own and my sister expecting another child in a month, I'd love to try out a few of these patterns! My grandma taught my sister and I to crochet edgings on towels and pillowcases. I am so thankful for the gift she gave us of being able to crochet. My Momma's first project was a crocheted afghan for me in brown, orange and beige using the shell stitch. I love it! That was in 1974, and she still makes pretties for me today. Hats, scarves and more afghans! I have tons of blankies that were crocheted for my when I was a baby by my 2 grandmas. Sadly one of them passed away a few years ago, but I was lucky enough to inherit her crochet hooks. They're all very ordinary, run-of-the-mill hooks, but to me they're priceless. my mom crocheted some wonderful blankets/throws for me. now that she has passed away i remember her anytime i use one of the beautiful blankets. The only item that I have that was crocheted for me.,is my lap blanket that my grandmother crocheted for me when I was about 10. My mother crochets and I think just about everyone in the family has one she has made! Posted on twitter as pammigliore. My mother taught my son to crochet when he was seven years old because they are both left handed and I am not. When he came home after spending the weekend with his grandparents my son presented me with a crocheted hotpad (which I still have) and a small blanket for our cat to sleep on. My son is now twenty seven years old and I treasure these items. I learned how to crochet when I was 7 or 8 from the neighbor lady next door. When I was a baby, my grandma and the neighbor, Mrs Graham crocheted us all kinds of blankets which i still have. this book looks so precious!! My grandmother made a blanket for me when I was a baby. It's the only thing I have left that belonged to her. She didn't live long enough to meet my daughter, but wrapping my new baby in it made me feel like I was sharing a deep love that has been passed down from generation to generation in my family. I would love to learn to crochet better so I can make a blanket for my daughter's baby some day. I have very fond memories of my grandmother crocheting. When I was born, she made a set of baby booties and a bib. They were made with white crochet thread, embroidery thread, pink ribbon and a very small crochet hook. I still have that set. Then when I was expecting my first daughter my grandmom made a set for her. At the time, my grandmom was in a nursing home. All three of my daughters wore those booties on their baptismal day. Even though my grandmom could not be at the church for their baptisms, I had her handiwork as a sweet reminder of her love and faith. My grandmom was left-handed and I am very right-handed. Although she tried and tried, she was not able to teach me to crochet. After she passed away, I taught myself and currently I am teaching my daughters. I hope to keep crochet in my family. Your give-a-way is wonderful. Thank you for the chance to win. Yes, I have had a a little old lady crochet me a doily once. I was 6 at the time and still have it! She is the lady that taught me to crochet at 5. She died about 13 years ago. I miss her dearly. My grandmother crocheted me a shawl when I was a teenager. I do not remember what happened to it, I think I gave it to my mother. I crochet some but I knit a whole lot more. When I crochet too fast and for too long I get cramps in my hand, any suggestions to prevent this? The daisy dress is charming, and I love the little caplet, it would be fun to make a few for my granddaughters. The bib would be darling on my grandsons Tobias and Leo!